The Son of Man is come to seek and to save that which was lost. – Luke 19:10. Our Lord, when on His way to Jerusalem, where He was to suffer and die, “entered and passed through Jericho. And, behold, there was a man named Zacchaeus, which was the chief among the publicans, and he was rich. And he sought to see Jesus who He was, and could not for the press [because of the crowds], because he was little of stature. And he ran before and climbed up into a sycamore tree to see Him, for He was to pass that way. And when Jesus came to the place, He looked up and saw him and said unto him: ‘Zacchaeus, make haste and come down; for today I must abide at thy house.’ And he made haste and came down and received Him joyfully” (Luke 19:1-6). What a blessed hour that must have been for Zacchaeus! – “And when [the people] saw it, they all murmured, saying that He was gone to be a guest with a man that is a sinner. And Zacchaeus stood and said unto [the Lord]: ‘Behold, Lord, the half of my goods I give to the poor; and if I have taken anything from any man by false accusation, I restore him fourfold’” (vv. 7-8). 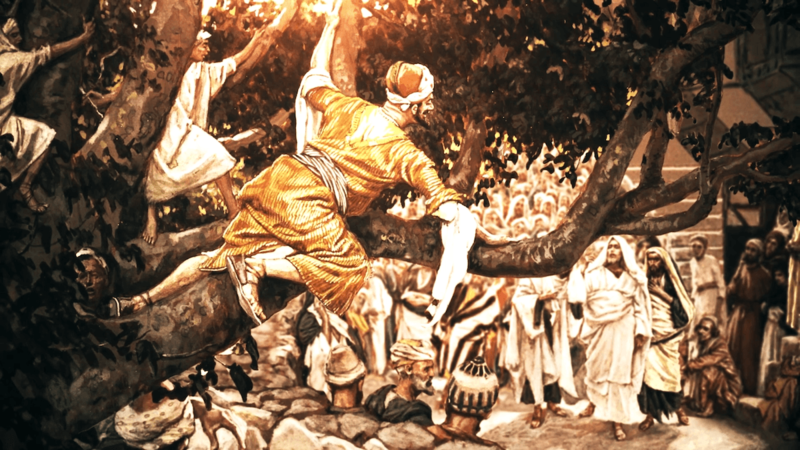 Thus Zacchaeus demonstrated true repentance and proved his faith in the Savior. “And Jesus said unto him: ‘This day is salvation come to this house, forasmuch as he also is a son of Abraham. For the Son of Man is come to seek and to save that which was lost.’” (vv. 9-10). Such is the grace of God in Christ Jesus, His gift of forgiveness, life and salvation, purchased and won by His Son and granted to all men by His reconciliation of the world unto Himself (II Corinthians 5:19). Earnestly desiring “all men to be saved and to come unto the knowledge of the truth” (I Timothy 2:4), the Father draws poor sinners to Jesus and, by His Holy Spirit, brings them to saving faith in Him through their hearing of His Gospel truth (Romans 10:17). Jesus then receives poor, penitent sinners most kindly (John 6:37), and continues to manifest Himself to them as their Savior and Redeemer (John 8:31-32). Through the Holy Spirit’s work, the poor sinners rejoice in the blessings of salvation which are theirs by grace through faith and begin to lead a new life of sanctification to His glory (Philippians 2:13). As believers, they are true sons of Abraham, the father of believers (Romans 4:16). And because of such grace, “which where sin abounded grace did much more abound” (Romans 5:20b), God’s mercy and gracious favor are not restricted by the enormity of a person’s sins. For the Father has sent the Son (I John 4:14), and “the Son of Man is come to seek and to save that which was lost” (Luke 19:10). PRAYER. – Lord, my God, I rest confidently on Thy saving grace in Christ Jesus, my Redeemer. O Heavenly Father, continue, through Thy Word, to draw me to Thy Son, my precious Savior, that in humble faith I always cling to His merits alone for Thy favor. O Jesus, receive me kindly as Thy rescued lost sheep, and grant me Thy salvation. O Holy Spirit, make me ever to rejoice in Thy gracious work in me through the Gospel. “Create in me a clean heart, O God, and renew a right spirit within me. Cast me not away from Thy presence, and take not Thy Holy Spirit from me. Restore unto me the joy of Thy salvation, and uphold me with Thy free Spirit,” that I may steadfastly confide in Thy grace and finally obtain the end of my faith, my soul’s salvation, for Christ’s sake. Amen. Rock of ages, cleft for me, let me hide myself in Thee. be of sin the double cure, cleanse me from its guilt and power. Rock of ages, cleft for me, let me hide myself in Thee!